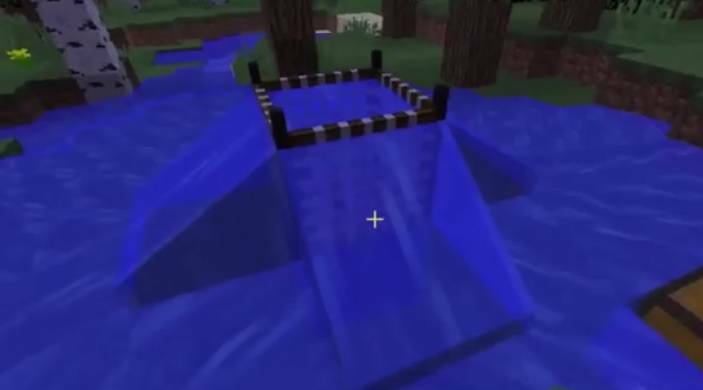 Water Strainer mod 1.12/1.11.2/1.10.2/1.9.4 is a unique addition to the list of Minecraft addons. This mod acts as a fishing net (filter/strainer) and allows you to extract items from the pool water. 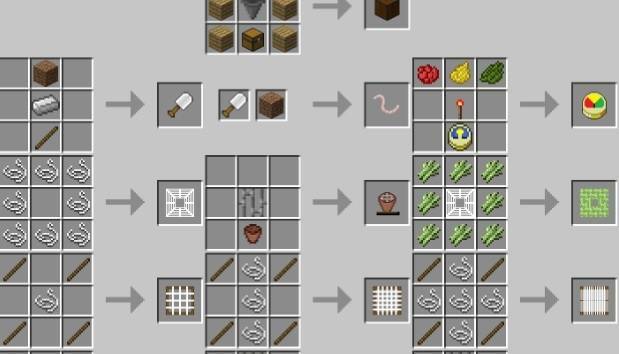 In survival mode, you can easily catch resources such as Clay, Gravel, Sticks and Sand. The fisherman’s strainer lets you catch Fish, Junk and Treasure present in water. Strainer can be made using different materials, allowing multiple levels of durability. Water must flow through strainer to catch items, so place strainer intelligently. (1) Craft a strainer base. (2) Craft any type of strainer. (3) Place the strainer base inside a pool of water (the base needs water on top). 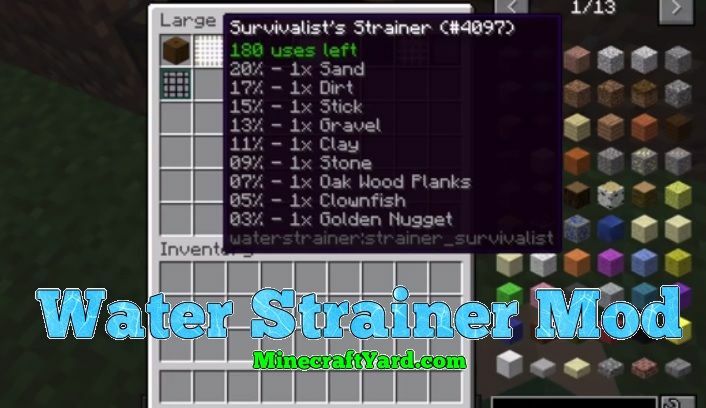 The strainer will now filter the water for items. The list of items depends on the strainer type. 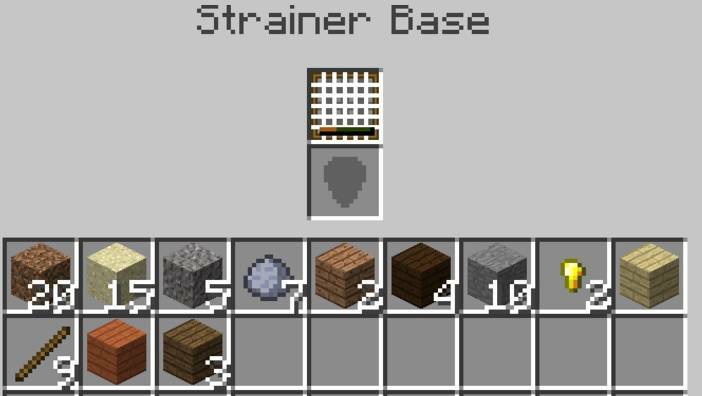 Items can be extracted from the bottom of the Strainer Base. Its a humble request that please keep the back of your Minecraft Folder. In case of any mishap we won’t held responsible. 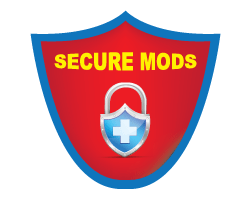 Following are the steps which led you towards installing desired mod. There has been a compulsion of Minecraft Forge API with almost 90% of mods. Initiate Minecraft and activate Forge Profile. Locate the .minecraft folder and mods folder. There you go. You just got your desired modification. We are fully determined to provide extremely safe environment and put our full energy in it. We also know the problems of the community because they are eagerly searching for the latest releases. But we have to make one thing clear right here that the content will only be available right after release. There is no way that a user can get the mod before the release unless its fake. 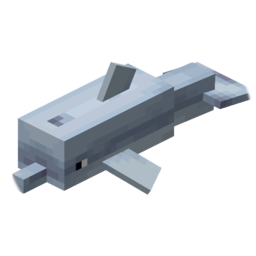 So we want to inform that please be patient for the official release in order to get the amazing experience of the Minecraft. We hope you will have a brilliant time playing Minecraft.